What’s the coolest thing about guns? If Airsoft guns scare you because of their strange looks, one more thing about these toys will take you aback even more: their prices. Truth be told, the humankind is used to cheap assets because the economy is just damn bad, but we can’t help but wonder about the high cost of the most romantic airsoft guns. The cheaper an item is, the lesser the pain. But, don’t you think it would be right to say that the more expensive an airsoft gun the more valuable it is? I’ll leave that to you to decide while I list the most expensive airsoft guns of all time. If you are not good with cramming toy names, you might want to write this “RWA MG34 AEG” on a piece of paper. The full metal best of a gun costs $1,400 USD. It comes with a custom-made gearbox, and it features 330 fps. What would you do with $957 USD? I don’t know; maybe buy two laptops, one for your girlfriend and the other one for personal entertainment. This airsoft gun, with somewhat a weird long name, costs just that much. But, here is something special about this piece: its barrel is pure metal, and the internal gear is accurate and durable. 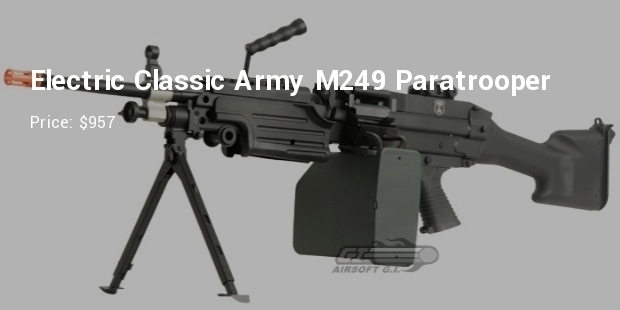 It is telescopic in design, and it has a bipod attached to the riffle. 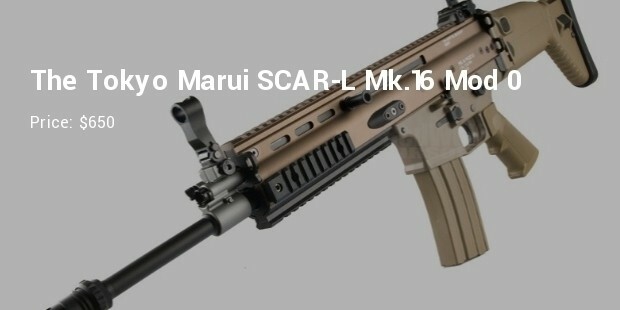 This gun has stimulated recoil for SCAR-L AEG functionality. How does it work? Well, it is very simple; the gun stops shooting when the magazine stops feeding. Press the bolt catch to fire again. Don’t buy this if you are not ready to spend $650 USD on a game toy. But, I promise you will thank me twice if you buy this one. It’s an amazing gaming piece. 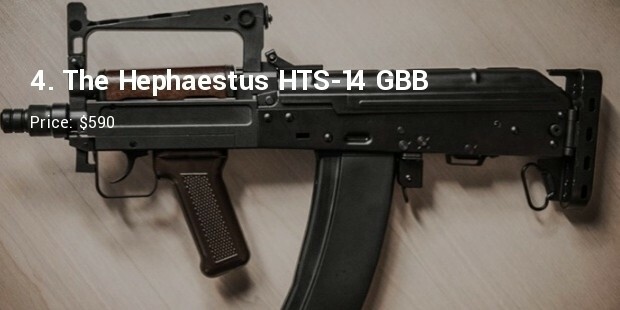 The Hephaestus HTS-14 GBB is a powerful gas gun made to look exactly like the OTs-14 Groza. The piece is a true work of art that will scoop $590 USD from your pocket. What was that? Does it read $590 USD for a toy gun? Okay, fine then. Although there are cheaper pieces that you might want to consider over these ones, you should go for one of these for pride and prestige. It doesn’t hurt to buy the most expensive airsoft gun if you have the money to burn, does it?